I really dislike carrying purses, so I carry a clutch instead. I received mine as a gift from my grandmother, whom I call “Grandmama”, for Christmas one or two years back. 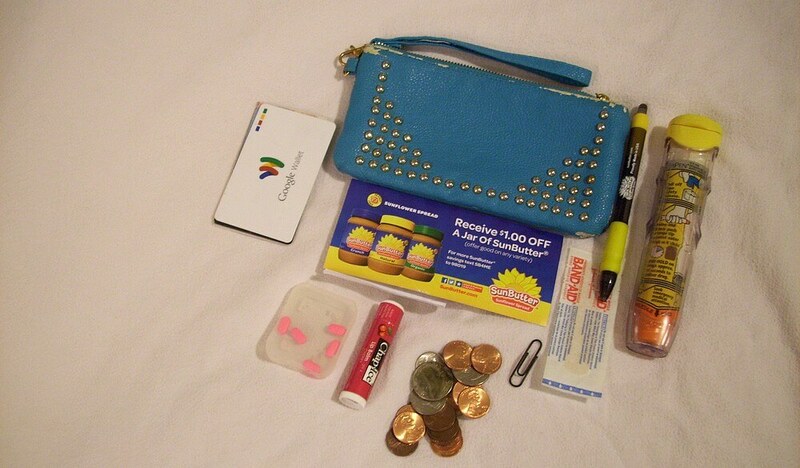 At first, I used it in my ancient American Eagle purse in desperate need of replacing. However, carrying a purse is annoying; the shoulder handles are almost always slipping off, and I have more trouble sorting out what to put in it than I do figuring out where everything is. Thus, I just starting carrying the clutch, which has a wristlet attachment on it. It’s small and compact, and it works especially well when I neither need my travel pack of tissues (either Puffs or Kleenex, thank you) nor my Albuterol inhaler. Pen — I prefer to use my own pen places, because cross-contamination/contact is a thing that affects me for certain allergens, and also because I simply prefer to use my own when and where I can. Chap Ice lip balm — My lips get dry a lot, which makes them tempting to bite, so I need to always have some on me when I’m out, if possible. I haven’t used it much lately, because I think it might have coconut oil, as I have a mild reaction similar to the kind I have when I consume coconut. I’m going to be trying Earthtastic’s vanilla lip balm soon; if it works, it’ll earn a spot in my life! It has jojoba oil, but I shouldn’t react to it, because jojoba isn’t closely related to nuts…I think its nut-like nicknames are just associated with it the same way soap nuts and nutmeg got their names. Cards — Google Wallet (for times when I actually have money in it, which rarely happens), debit/bank/check card, license, biz card with home/contact info on one side and allergist’s contact info on the other side (the backs are glued together). I also have a biz card of my old therapist with me. There is also a random paperclip and Band-Aid, the latter of which I added because I’m mega accident prone. I have always been a fan of cross body bags because I don’t have to bother with the handles slipping off my shoulders or sliding down my arms, etc. It’s very mindless (is that the right word?) to carry a handbag with me. Though, saying that, I’ve slowly been getting into handbags, haha. What a cute clutch! It looks small, but it really fits a lot in there. That is such a smart idea to use a memory card for medicine. I want to carry Ibuprofen or something with me, but don’t want to lug around the big bottle and haven’t found anything small enough to work. I may have to do some digging to find an old case now! I admire the fact that you can keep the things you put into your clutch at a minimal. I can only use a clutch if I am going out to banquets XD. I have too much stuff every other day @___@. Meanwhile, I’m here looking for a wallet the side of your clutch. It’s good to hear that people are using Google Wallet! I like it better than the Paypal card. Having loose change is definitely helpful at times but it makes my wallet heavier after a while. It’s pretty creative hwo you put the little pills in your memory card case. It’s pretty slim and does the job! I guess another thing would be keeping it in an empty container of chapstick, but I’m not sure how air-sealed it is. I carry a whole bunch of things in my purse from my sunglasses case to a little notebook to keep notes :3. The clutch is really cute and it would be very practical. I am actually kind of amazed that everything fits in it! It’s pretty cool to see currency from different countries, especially change as it’s becoming less common with cards. I changed my bag recently and I am trying to keep things simple. I have notepads, phone, pen, sunglasses, lipgloss, keys, hair tie, a random stone that a friend gave me 15 years ago and has gone in every handbag since, mini torch and important recipes kept in a passport pouch (with no passport haha). I’m impressed at how light your clutch is! I’ve grown into the habit of not carrying too much either, but my makeup and camera add a good but of bulk. My phone is pretty big too, so I can’t use a clutch myself. Am I fan of cross body bags bags and like one with a main zip up compartment and a small zip up pocket on the front. I usually carry my purse, mobile phone, a pen, Chapstick, perfume, small deodorant, painkillers, antihistamines (I have a metal allergy – most ‘cheap’ metals like nickel), some blister plasters (just in case) and a hairbrush.